Okay Folks, I may have listings up on eBay, I list dolls, doll clothes and doll furniture, and some other stuff, check out eBay!! Kestner Dolls...Fine Composition and Bisque! Although the name of J.D. 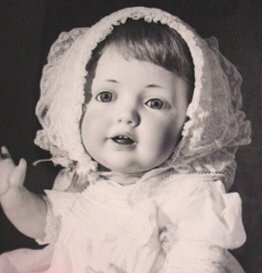 (Johannes Daniel) Kestner has been associated with dolls since 1805, this particular reference is made to the beautiful babies circa 1910-1925. Exquisite bisque heads with composition bent leg bodies, none can compare to the quality and distinction given the delicate features of each character baby. Considering they were manufactured for children, it is indeed sad to compare the mass-produced types of vinyl for children today to the artistry of Kestner. 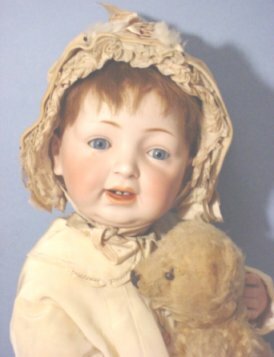 There were several mold numbers associated with these beautiful dolls and even though collectors seem to favor "Hilda" (#'s 237, 245, and 1070), my personal favorite is the #211. The features and expression forever fashioned in fine bisque are that of one happy baby! For some reason, I always felt they had "cut" one eye on Hilda incorrectly, the #211 mold to me is perfection. Solid dome or with a wig, each individual #211 has a distinct personality. Detail is one of Kestner's characteristics. Even the feature given to the outline of fingers and nails is mostly attributed to Kestner. 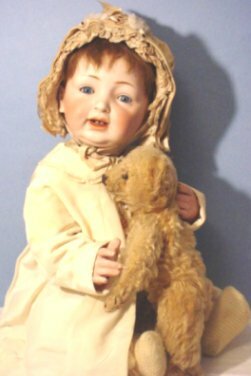 eBay has a rather large set of listings of vintage Composition and Bisque dolls for sale if you are interested in a purchase, or to find values, click here (if looking for costs, it is necessary to register with eBay). My favorite Kestner Doll babies...ranging in size from 14" to a healthy 24"... but I love all of them. One of the most common and more frequently found Kestner mold numbers is 154. 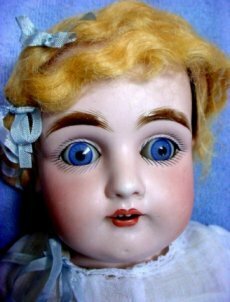 A shoulder-head with sleep eyes and open mouth...........the number 154 mold has the distinct thick Kestner brows. The bisque hands on the kid leather bodies are well formed and well detailed. Many doll bodies still bear the Kestner shield label on the chest. This Kestner 154 resided in a Montana garage for many years.......and only recently was discovered. She is still wearing her original white chemise. Over the chemise is an old advertising shirt for a local hardware store which has long since ceased to exist. Her eyes are a brilliant blue accented by the old silk ribbons which were probably added by a young mother many years ago. Other readily accessible books regarding Kestner Dolls...Kestner is a favorite! You will find information and photos in many current publications. 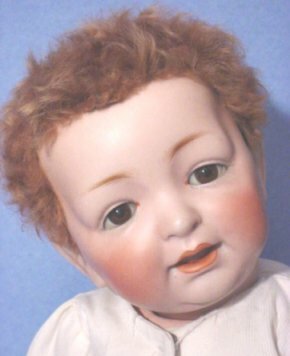 Probably the best place to look for a present "doll and accessories" value is on the Internet, primarily the auction sites--my favorite is eBay... in the completed Kestner Dolls section of eBay you can browse the past 30 days of completed auctions of Kestner dolls and accessories. On the left side, in the box named "Display," you can select "Active Items" to see the "Kestner dolls and accessories" presently up for auction. 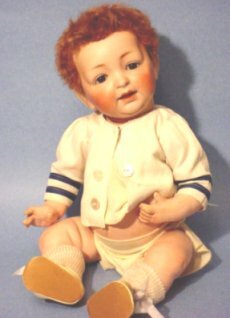 Also, if you have a doll or doll accessories you would like to find out about...eBay is the place to start. Look in the Dolls and Bears Category, just type in what you have in the search window just under "Dolls & Bears" on the left, and "Shazam", there appears a list of present, up for auction items--in the "Display" box on the left select "Completed Items", a new list will appear, displaying completed items going back for 30 days. Welcome to "Show and Tell" for early Kestner Dolls! We all love to share. 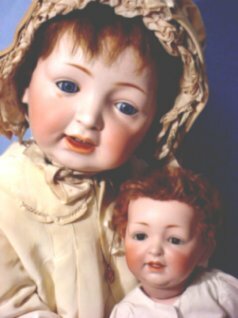 If you have photos and information about these lovely old Composition and Bisque dolls, please fill in the form below to "Show and Tell" your favorite Kestner doll. We all have an interest in how they were located, the use of materials in their clothing and anything else you would like to share with other avid collectors. doll with X mark...is it kestner? ?